Visiting art and history museums with a small child may seem like the perfect recipe for a disaster. Fill in the blanks: Florence’s Uffizi Gallery, London’s National Gallery or any other splendid art and/or history museum you are simply dying to see. This could be a toddler or a preschooler. Not a baby anymore and hence unwilling to simply be carried in and out of places as long as plenty of food, clean nappies and naps are provided. No, a toddler or a preschooler – those exciting years between 1 and 5 (in some countries even 6) when the child moves a lot, speaks in a loud voice, sometimes even shouts, eats messily, needs the toilet at inopportune times and, it is generally accepted, is not interested in history and art for not having a firm grasp on the concepts of what history and art are. Still, you are a person open to the world and would like to see and experience as much of the art and the history of the place where you are enjoying a day trip to, a city break in or simply a glorious long vacation. So, how to combine your interests with those of your little one and leave everyone happy? ‘Everyone’ including not just you and your child, but also the respective museum’s other patrons and staff. What to do if you simply can’t leave your child with the hotel’s childminding services, your other half or another trustworthy person? What to do when you honestly believe that children do need to experience art and history early on in their lives and you want them to start developing their observation and appreciation skills as soon as possible? Well, here are 13 tips to help you do just that. It is all based on my own first-hand experience of visiting together with my little daughter dozens of art and history museums and galleries in Europe, predominantly in Italy, England and Bulgaria. Doing so, we found ourselves in all sorts of situations which I have distilled in the real-life examples given after each tip below. 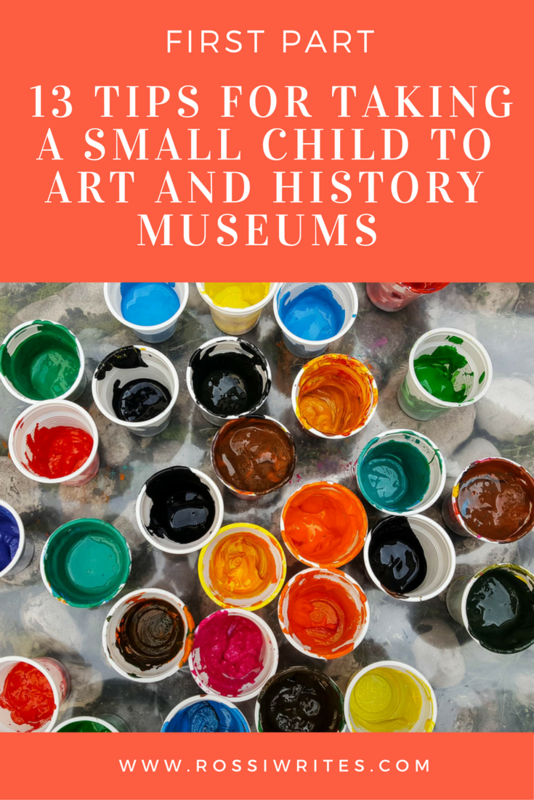 Read on and at the end, remember to let me know what you would add to this list as well as share with me some of your real-life experiences of bringing a small child in the realm of an art and/or history museum. The sooner you start taking your child into art and history museums and galleries, the quicker they will get used to an environment which is so extremely different to anything else they experience in their day to day lives. Rooms filled with objects which cannot be touched, solemn and serious members of staff patrolling around, other patrons completely wrapped up in a peaceful appreciation of the exhibited works of art or historical artifacts. A place where running and speaking loud are definitely frowned upon. For your child it could be a bit of a culture shock. After a while they may start to fidget, cry, even scream. You may attract disapproving glances. Sometimes, you will immediately know that it is time to leave. Don’t let any of these potential occurrences discourage you to make the first step. The sooner your child is gently introduced to art and history museums and galleries, the sooner he or she will start absorbing the expected rules of behaviour in such places. There will be a few hiccoughs along the way. At times you may even doubt your parental skills or get upset by a unkind remark. Still, unless we start cultivating an early appreciation for art and history in our children, we cannot expect them to magically develop an interest in museums and galleries once they reach a socially more manageable age. So, if you love exploring the cultural heritage of a nation, if you think art is important for us as humans, keep persevering. Much sooner than you expect, visiting a museum with your small child would actually become a really interesting and stimulating experience, as you would be able to see art through his or her eyes and rediscover history in simple, unadulterated terms. A Real Life Example: To ease your small child’s introduction to art and history, look for museums and galleries which organise special kid-friendly events. Many Italian cultural institutions now have a rich program aimed at the little ones, offering workshops, guided tours and even museum sleepovers. One wonderful experience for us as a family was an architecture workshop for children organised by the Palladio Museum in Vicenza. Andrea Palladio being one of the world’s greatest architects, you wouldn’t think there would be much to interest a small child in a museum dedicated to him and his works. Yet, the museum organised monthly events at which children would learn about basic tenets of architecture. At the workshop my little daughter attended, the children were taught about the three different types of classical columns – Ionian, Corinthian, and Dorian. Then the children made their own columns out of blocks created by the museum’s model maker and had lots of fun painting the finished columns in a rainbow of colours. Start by taking your small child to smaller local or regional art and history museums and galleries. Places, where the footfall is not high and where you can explore the exhibition without having to jostle for space with hundreds of other visitors. Often such places hold a very interesting collection which is somehow overlooked by the masses, so you can take your time discovering the story behind the different artifacts. Visiting smaller museums and galleries for half an hour or an hour at most at the beginning will not only slowly build up your child’s interest in art and history, but will also give him or her time to practice the behaviours expected in such environments. It is much easier to reinforce the need for not running, not touching and not speaking loud in a museum, when there are no other visitors’ around to add to the parental embarrassment factor. A Real Life Example: The Diocesan Museum in Vicenza and the Museum of Fondazione Querini Stampalia in Venice are both great places to introduce your small child to the joys of art and history. Both are small, not overwhelmed by tourists and easily managed within an hour or less. Yet both have fabulous collections with lots of little details to keep one’s attention – from richly painted and stuccoed ceilings to exciting paintings, from lavishly embroidered liturgical garments to a collection of spheres made of semi-precious stones. Even though art and history museums and galleries are relatively safe environments with robust CCTV systems in place, you need to have a chat with your small child before your visit and reinforce some simple security concepts in him or her. Security here refers both to the well-being of your child and the sanctity of the exhibits. Explain that there will be other people there, so you two need to stick together and your child cannot simply let go of your hand and go explore at the other end of the room, without asking you first. Emphasise that the exhibits you are about to see are incredibly precious and they cannot be touched, pushed or disturbed in any way. Mention the fact that statues and bas-reliefs weigh a ton and it is strictly forbidden to kick them, try to dislodge them or knock them off, as there will be serious legal and health-related consequences if one of them falls off. A Real Life Example: When I want to take a picture in a museum, I always ask my little daughter to hold with both hands onto my leg. I also place one hand on top of her head. This way, I know that she will not wander off, whilst my attention is momentarily focused on the camera. Also, I would only take a picture if there are no other people around us. Art and history museums and galleries have a certain code of behaviour which you need to communicate in simple terms to your small child before each visit. Unlike many interactive museums where touching and pressing on buttons is highly encouraged, usually and for obvious reasons the patrons of art and history museums and galleries are expected not to touch absolutely anything. For a small child it may be difficult at first to grasp the idea that the beautiful and exciting things in front of his or her eyes cannot be touched. Well, it is your task as a parent to explain and reinforce this. Apart from no touching, here are some other things which should be avoided during your visit: running, screaming, kicking, pushing, pulling, shoving, scratching. Not to forget no eating and drinking in the rooms with the exhibits. You also need to explain the role of the thick (usually) red ropes barring the access to certain points within the museum or the gallery. A Real Life Example: As a parent, it is your responsibility for your small child to follow the rules of the museum and/or the gallery. I have found that explaining right before our visit and in very simple yet affirmative terms what can and cannot be done seems to work best in formulating what the expected behaviour is. The thing with small children is that they generally learn through repetition. So, even though you may have had the most amazing parent/child talk right before entering the museum as to how your child should behave, once inside and overwhelmed by the works of art and historical artifacts, he or she may simply forget all that you have just discussed. Then it is up to you to reinforce again and again the behaviour expectations you have set up. Gently, but firmly you need to remind your small child that they need to talk quietly, that they cannot touch the paintings and that they cannot run around. Don’t be a passive observer or your child’s behaviour. Step in, hold them by the hand, if need be, set up safe limits as to how close they can get to artifacts, how close their fingers can get to the surface of the paintings (when they want to point a certain detail to you) and how loud they can speak. Be an example of acceptable behaviour yourself. It is not a question of restraining your small child, but to teach him or her to respect the environment and the works of art and the historical artifacts it houses. It is a gradual process, building on each visit you will make. A Real Life Example: There are two phrases I often use throughout a museum visit with my little daughter. One is ‘We need to speak quietly, please!’ and the other is ‘Don’t forget we cannot touch anything here!’ It is only to be expected that a child may become distracted, overwhelmed, tired or even emotional during a museum or a gallery visit. As parents, we need to step in and make sure that we gently guide our child while developing his or her respect for art and history. Honestly, this is the most important question you need to ask while you are buying your ticket. And you need to be specific. Are there toilets on each floor? Are they easy to find? Is it a long walk from the exhibition rooms to the toilets? Do you have a family room? If not, can the disabled access toilet be used by parents with kids if there is a really long queue for the ladies or gents? Small children often wouldn’t tell you that they need the loo until the very last minute. You don’t want the stress of having to rush through endless rooms with priceless artifacts in a desperate search for the toilets. A Real Life Example: In addition to always asking where the toilets are, I also always carry a pack of wet wipes with me. They have been a lifesaver on many occasions. Now, let’s be honest here. You don’t really expect to take a small child to an art and history museum or gallery and have deep conversations about the Italian masters vs the Flemish masters, do you?! Quite often, the only reason you would (at least initially) go to such a place with a child is that you didn’t have anyone trustworthy enough to leave him or her with. Still, this is not a reason to simply drag your small child through the museum like a spare piece of luggage while you are pretending that you are enjoying your visit there. Instead, try to involve your child in the experience by playing a simple but effective game of observation together. You know how nursery teachers would take the small children to the local park or garden to observe the autumn leaf colours or the first spring flowers? Then the children would return to the nursery and draw pictures based on what they have seen? The important thing is to make your small child look at the art around him or her with inquisitive eyes and to start picking out little details. Looking is not the same as seeing and, when we are surrounded by countless paintings and statues, it is only too easy for it all to become one huge confusing blur. Focusing your small child’s attention will give him or her a starting base to explore the art and to initially see it as a depiction of the world around us. A Real Life Example: You can expand the game of observation to teach your small child new words. For example, they may know what an ‘angel’ is, but do they know what a ‘cherub’ looks like? They may have seen a ‘pigeon’ in real life, but would they have seen a ‘pheasant’? This way the paintings will become the world’s most exquisite picture book and help your small child expand not just his or her vocabulary but his or her horizons, too. OK, here you have them – the first seven out of 13 tips for taking a small child to art and history museums. The second part of this blog post will be posted on the blog in the next couple of days, so keep an eye out. Do you take your small children to art and history museums often? Or are you one of those people who think that museums should be adult-only zones? Let me know! I like that you said that it’s best to remind your child that they should refrain from touching paintings, and they must talk quietly. With that in mind, I’ll make sure to briefly explain to my children what we should do in art exhibitions. My husband and I want to tour art exhibitions with our children because we want to share with them our passion for art and our love for paintings. Thanks! Thank you so much! I read your article last night and I loved it! I hope that we can manage to stay in touch.